The year was 1924. A Royal Bengal Tiger was on the prowl in Karponang in East Sikkim district. Following its pugmarks, Frederick Marshman Bailey, a British intelligence officer and explorer, took a shot at it. Bailey missed the target but saw the terrified beast as it escaped. He followed the tiger as it wandered across Lagyap and Tsomgo regions at an elevation of 3,500-3,800 metres, killing livestock and a yak on the way, crossed a 4,000-m ridge and reached Dikchu valley where it was finally killed. Almost 100 years after this first recorded occurrence of the big cat in the high altitude Himalayan state of Sikkim, on December 6, 2018 camera traps captured footage of a Royal Bengal Tiger in Pangolakha Wildlife Sanctuary at an altitude of 2,921 m. The tiger was again spotted on December 28. This is not the first evidence of a tiger in high altitude Himalayan regions of the country. In December 2012, tiger cubs were found by the Idu Mishmi tribe in the Dibang valley of Arunachal Pradesh. This prompted a study by the Wildlife Institute of India (WII), Dehradun, sanctioned by the National Tiger Conservation Authority (NTCA). Camera traps set up by WII revealed the presence of 11 tigers in the valley and showed a Bengal tiger roaming in the snow-clad peaks of the Mishmi Hills in sub-zero temperatures. At 3,630 m, these were the highest photographic evidence of tigers in the Indian part of Eastern Himalayas. 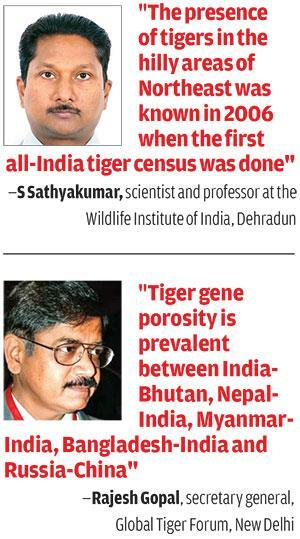 S Sathyakumar, scientist and professor at WII, says the presence of tigers in the hilly areas of the Northeast was known even in 2006 when the first all-India tiger estimation was carried out. But the population was presumed to be low. In 2010, Northeast was included in the census exercise but Sikkim and areas above 2,000 m were excluded. Finally, these areas have found a place in the 2018 tiger census. Irrespective of tiger census reports, the hills are full of tales of tigers—roars have been heard, pug marks seen and anecdotes told by people and foresters alike for generations. G V Gopi, scientist at WII, who is at the helm of surveys in Dibang valley, says, “Idu Mishmis consider tiger as their brother and have known about its presence in the region since time immemorial. The animal is revered across the valley and traditional laws prohibit its killing.” In Sikkim, some refer to it as aba-bompu (maternal uncle), says Dechen Lachungpa, divisional forest officer, East Sikkim. Folklore aside, the writings of Jim Corbett, the legendary British hunter-turned-conservationist, provide proof of tiger presence in the higher elevations of Nepal and Kumaon region of India in the late 19th and early 20th century. In Sikkim, Khituk Bhutia, a yak herder from Yali forest, narrates an incident that took place 20 years ago when his horse was attacked by a tiger. Two more herders, Rinzing Ronchuk and Lachung Norbu, from Bhusuk forest share similar stories. Usha Lachungpa, retired principal chief research officer (wildlife) of Sikkim, has known the state’s high altitude forests very well. She says all the tiger reports are from the Lachung side of the Teesta river. As mentioned in her report in the 1998 volume of Journal of Bombay Natural History Society, she in 1994 photographed a tiger jaw and skull with hunter Thendhup Lachungpa, who claimed those to be 40 years old. In 1998, Lachungpa was called in for a tiger kill in Nathang area with carcasses of over 60 female yaks with foetal bones. Plaster casts were taken of clear pugmarks of a tiger. “In the past two years, tigers have also been photo-captured in higher elevations of Uttarakhand (Pithoraga rh and Uttarkashi),” says Sathyakumar. 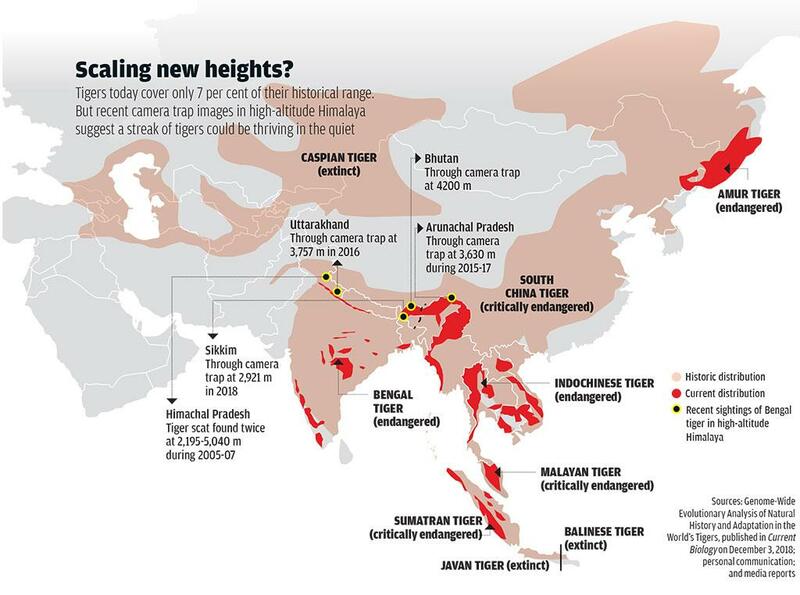 “Tigers have always been present in high altitudes with a slight dip in reports in past decades. The recent increase can be in part attributed to better research techniques and more exploratory studies in areas that were untouched earlier,” says conservation biologist Abhishek Harihar. Mahendra Shrestha, programme director at the Smithsonian Conservation Biology Institute, Washington DC, explains: “Tiger is a resilient species and can adapt to diverse habitats, ranging from cold taiga habitat in Russian Far East to hot tropical forests in Malaysia and Indonesia, grassland and subtropical forest along the Himalayas and swampy mangroves.” It can occur anywhere as long as it gets enough prey species, mainly ungulates, bovids, suids, to feed on and a secured habitat for breeding, says Shrestha. Are they residents or migrated? The Bengal tiger is today found in small, isolated pockets through India, Bhutan, Bangladesh and Nepal. Corridors linking these fragments give back to tigers what they need most: space. Dechen Lachungpa emphasises on research on dispersal corridors. Organisations have launched initiatives to understand the habitat and spread of the carnivore in the snowy mountains across India, Nepal and Bhutan. One of the largest tiger studies today is carried out by GTF and co-implemented by NTCA, WII and WWF-India. Bishan Singh Bonsal, retired member- secretary of NTCA and project head of GTF, says they aim to come up with a map on the presence of high-altitude tigers in the three countries. In India, so far 600 grids have been covered, of which 281 grids show their presence, particularly in Anani of Aru nachal Pradesh, Askot of Pithoragarh, Kedarnath and Nanda Devi in Uttara khand, Sikkim and Neora Valley of West Bengal. Adhikarimayum says in areas with no connecting populations, genetic studies should also be done to determine genetic uniqueness. “There is tiger gene porosity prevalent between India-Bhutan, Nepal-India, Myanmar-India, Bangladesh -India, and in Russia-China in Amur-Heilong region,” says Gopal. Shrestha too cites examples of tiger movements between India and Nepal along much of the Terai Arc Landscape. While Gopal repeats that as of now they are not looking at numbers, but more concerned with the spatial distribution of tigers, Christi Sylvia, senior project officer at WWF-India, says the rationale is that many of these areas were likely used extensively by tigers in the past, and small remnant populations may still occur in some areas.